I recently spent a weekend reading through Heath W. Carter’s recent book entitled Union Made: Working People and the Rise of Social Christianity in Chicago (OUP, 2015). It is a wonderful book that traces a complicated history in a manner that brings it to life and works to give new life to important voices from the United States’s religious past. And these are voices that it is important for us to hear, as Carter notes as the book concludes, in a time when we are once more approximating the socio-economic dynamics of the Gilded Age, which is the focus of the book. Hey, look at that! This post is only a week overdue, since the last link post was three weeks ago. That’s doing pretty well, considering my track record lately. There’s been lots of stuff going on as usual at DET and across the theo-blogosphere, and this post is your one-stop-shop to catch up on anything that you missed. So kick back with your beverage of choice, flip your brain into “theology blog” mode, and enjoy some stimulating reads! Did C.S. Lewis Invent the Concept "Atheology"? Well, things have been hot and heavy around here at DET this week with two dynamite posts from Our Illustrious Leader (see here and here). Our Marketing and Communications departments have been working round the clock to keep up with the traffic and I figured these folks deserve a little time off. 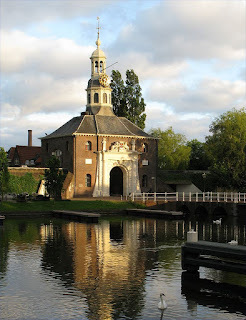 So please allow me, dear readers, to switch things up a bit with a post on ... wait for it ... C.S. Lewis. The guy who introduced our readership to Walter Rauschenbusch and Teilhard de Chardin (see Shameless Self-promoting Plugs Nos. one and two, respectively) is now squaring the circle by inserting into this venerable blog a post about the beloved children's author, Renaissance lit critic and Oxbridge don. Earlier today the Gospel Coalition put up a post on their website (I won’t link it for you) quoting D. A. Carson at some length on Barth’s doctrine of Scripture. While Carson’s comments are very gracious to Barth overall, he nonetheless lodges a number of criticisms against Barth. His critical remarks are exactly what you would expect from someone who elevates a collection of ancient texts as the equivalent of a second or secondary divine incarnation. Another way to put this is to say that these comments are what you would expect from what I have come to think of as an Islamic doctrine of Scripture, given the similarities to Muslim thinking about the Qur’an. I provided an introduction of sorts to Congdon’s tome in an earlier post. Today I want to return and highlight a piece of his text that seems particularly valuable to me. David W. Congdon, The Mission of Demythologizing: Rudolf Bultmann’s Dialectical Theology (Fortress, 2015). When I was a student at Princeton Seminary, I remember coming into a darkened Chapel on Ash Wednesday evening. The Chapel was bare, with just purple paraments on the lectern and pulpit. There was scripture and liturgy, based around Isaiah 58, Psalm 51, Joel 2, Matthew 6, but what I remember best was the imposition of ashes. Kneeling in the front of the chapel with my head bowed, the pastor of the Chapel put ashes on the top of my head, and pressing down with both hands she intoned, “O man, thou art dust, and to dust thou shalt return.” And when he took the pressure off my head, I thought I would faint. Some young whippersnappers in the theoblogosphere have been making really good use of Twitter and other social media engines to drive reader engagement on their blogs through things like polls. That looked like fun. So I went on Twitter and found the button to make a poll and, well, proceeded to make a nuisance out of myself. Blame whomsoever thou willst, but I decided to do a set of three polls to identify which theologians people out there are reading but on the down-low. Furtively. With a sense of shame. Having to wash their hands after turning ever page. You get the idea. Why? Because apparently asking “Who’s your favorite theologian out of these four” just wasn’t going to cut it for my sleep-deprived and caffeine-driven mind. In any case, the results are collected below with some…let us say…brief commentary. I don't win many things. I'm not good at playing the lottery (especially since I never play it), and I've never won a round of Monopoly. But the Center for Barth Studies made me a winner, at least once: I entered the winning photo caption for a KBC contest on Facebook and, for this willingness to embarrass myself, was rewarded with this superb monograph by Kevin M. Vander Schel. (Neither the shout out nor the review were obligatory, but I always like to give a hat tip to anyone who sends me a free book.) I was rewarded even more when I finally made some time recently to read it. 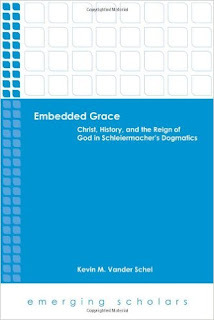 Embedded Grace: Christ, History, and the Reign of God in Schleiermacher's Dogmatics by Kevin M. Vander Schel (Fortress, 2013). I’m taking a little bit of a risk in posting this long quote from Luther. It is a compelling quote with important political implications in our contemporary context. But, as you will see, it is possible to interpret this as being anti-government. I am *not* anti-government. And neither was Luther. This is just embarrassing. I need to take that line about a “fortnight” off of my template for this post because it has been a long, long time since I lived up to it. In fact, it has been over a month since the last DET link post! My apologies, gentle readers, for leaving you for so long without both a handy collection of interesting reads with which to while away your weekends (or, let’s be honest, work-weeks), and a convenient index of what we’ve been posting about around here. Fear not! The links you seek draweth nigh. Twenty-one years ago, theologian George Hunsinger wrote an essay titled "What Can Evangelicals and Postliberals Learn from Each Other? The Carl Henry/Hans Frei Exchange Reconsidered." Back in the mid '80s, Carl F.H. Henry, the Christianity Today editor and major architect of the post-war neoevangelical movement gave a series of lectures at Yale Divinity School that offered a respectful but highly critical assessment of the burgeoning postliberal theology movement. Hans Frei responded, defending a his narrative-theological biblical hermeneutics and theology. Then once more you shall see the difference between the righteous and the wicked, between one who serves God and one who does not serve him. [4.1] See, the day is coming, burning like an oven, when all the arrogant and all evildoers will be stubble; the day that comes shall burn them up, say the LORD of hosts, so that it will leave them neither root nor branch. But for you who revere my name the sun of righteousness shall rise, with healing in its wings. You shall go out leaping like calves from the stall.